The founder of Australian honey innovators Berringa has taken the Hall of Fame Chairman’s Award at Australian Organic’s fourth Annual Awards for Excellence 2017. 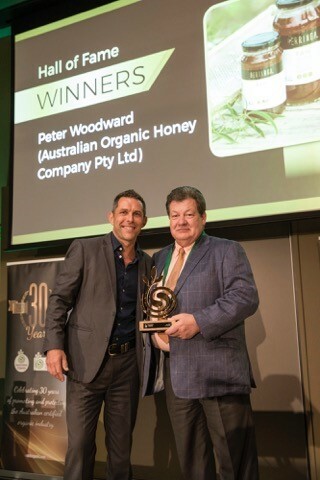 Peter Woodward, who is also Chairman of the family owned Australian Organic Honey Company (Berringa) picked up the gong for his years of service and contribution to the organic sector in Australia. “I am absolutely thrilled with the recognition from this prestigious award and it is with thanks to all my colleagues and partners that I receive this honour,” says Peter Woodward. Playing an influential role within the honey industry, Peter was responsible for writing and implementing the Australian Honey Standards during his time as Director of the Australian Certified Organic Organisation (ACO). These standards were later adopted by the International Federation of Organic Agriculture Movements (IFOAM) and the Soil Association of the UK. Peter’s involvement in the honey industry spans over 20 years. It is from his unrelenting quest to find the world’s best honey that Berringa has become a globally recognised leader in producing the highest quality 100% Australian Eucalyptus and Manuka Honey. Australian Organic’s Annual Awards for Excellence recognises finalists from all over the country and across a broad variety of categories including cosmetics, business, innovation, beverage and food.